Despite its name, this was the site of one of the oldest inns in the city. Writing in 1880, Robert Dymond stated that "we may enter it now without any suspicion of its antiquity" but the New Inn had been Exeter's principal tavern for centuries. The building of the inn began in 1445 when the Cathedral's dean and chapter sanctioned the construction of a tavern on some of their land near the High Street. Its construction is mentioned in one of mayor John Shillingford's papers dating to between 1445 and 1450 in which he describes the inn as "a new tenement above Seynt Stephyn ys churche of Exceter". It is mentioned specifically in a lease of 1456 when two tenements opposite "le Newe Inne" were granted to Roger Schordych and his wife Joan by the Magdalen Hospital. 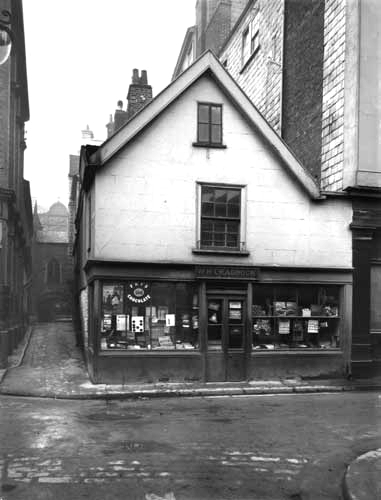 The inn was located on the corner of the High Street with St Stephen Street, a narrow alley that ran from the High Street, down the side of St Stephen's Church and into Catherine Street. The image right shows a modern aerial view of the site of the New Inn overlaid onto which is a detail from the 1904 map of Exeter. The area highlighted in red corresponds to the boundaries labelled as the 'New Inn' which appears on the 1876 Ordnance Survey map. St Stephen's church, mentioned by Shillingford, is highlighted in green. The High Street is at the top running from left to right. The passage of time, the lack of documentary evidence, the destruction of the building itself and the complete redevelopment of the area makes it difficult to know with any certainty the original extent of the medieval inn. When the New Inn was sold in the 18th century it had 40 rooms and three dining rooms, but this would've been a much expanded structure in comparison with the 15th century building. In 1554 the city authorities took over the lease of the New Inn to use as a cloth hall (the manufacture and sale of cloth was easily the most important component in the city's economy from at least the 1300s to the beginning of the 19th century). According to Robert Dymond, since 1472 the previous cloth hall had been located at another nearby inn, the Eagle, opposite the Guildhall. A document in the city archives states that "the Newe inn [is] to be bought of Christian, the wydowe of Thomas Petefyn, and the same to be converted into a commodious hall for all manner of clothe, Lynnen or wollyn." The newly-established cloth market opened in 1555. Another contemporary document orders that "there shal be a faire paire of stairs made there forthwith, for better going upp into the said room" i.e. the cloth hall. 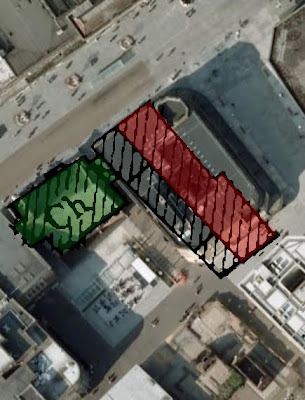 It appears that the cloth hall was to some extent a separate structure to the rest of the inn. Dymond writes that "after the year 1612, we find many references to 'the New Inne Halle'" which was "let separately from the inn. There was shops and stalls surrounding the cloth hall which could be rented by merchants from all across the country. Clearly the New Inn was a significant building, stretching from the High Street all the way back to Catherine Street. There was stabling, allegedly for one hundred horses, on the other side of Catherine Street and occupying land once owned by Lord John Russell, the former owner of Bedford House. The image left shows a detail from Hedgeland's model of Exeter as it appeared in 1769. 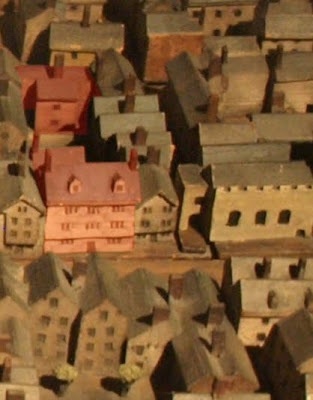 The building which stood on the the site of the New Inn is highlighted in red, the crenellated top of St Stephen's church visible to the right. Although Hedgeland's model is wonderfully detailed it isn't infallible. It does however possibly depict a reasonably accurate version of the mid-17th century form of the New Inn's High Street facade. The New Inn underwent a radical rebuilding within a few years of the Restoration of Charles II in 1660. Some of this rebuilt version of the inn survived until 1942. The chief architectural feature was the Apollo Room, begun in the 1640s as a banqueting hall. The dimensions of the Apollo Room were 32.5ft long, 23.5ft wide and 17.5ft high (the original height was reduced slightly when the inn was converted into shop premises in the 19th century). Sidney Heath visited the Apollo Room in the early 20th century and described it thus: "[The Apollo Room] is now used a showroom, but it still retains its elaborate plaster ceiling, bearing the date 1695, and the original oak panelling. The frieze consists of a series of wreaths upholding shields charged with the armorial bearings of many county families, together with the royal arms and those of the city." The arms of the "county families" were those of Hillersdon, Calmady, Prestwood, Acland and Radcliffe. Decorative plaster ceilings of this type were something of a Devon speciality and were once found in many Exeter properties. Thomas Lane was employed to create the Apollo Room ceiling, part of which is shown above © Devon County Council. He received 5 shillings for every yard of work and in total he was paid £50. Work on the ceiling itself was started in October 1689 and was complete by March of the following year. The royal coat of arms and the other "armorial bearings" were all painted by John Stannaway. 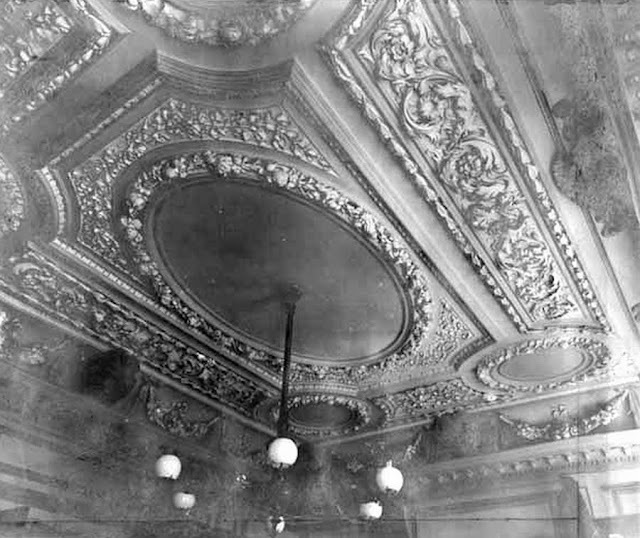 The Apollo Room was one of the finest chambers of its type in south-west England and certainly the finest late-17th century plaster ceiling in Exeter, far exceeding similar examples at the Half Moon Inn (demolished in 1912) and at the Custom House on the Quay. Its destruction was a huge loss to the city's heritage. Dymond theorises that the name of the room possibly derived from the Apollo Club in London, "a place of great resort in the reign of James the First". The main room in the Apollo Club was called the Oracle of Apollo and had a bust of the god set above the door. Other sources claim that there was a figure of Apollo set into the ceiling itself. The photograph, right © Devon County Council, dates to 1911 and shows the narrowness of St Stephen Street as it lead towards the High Street under the arch of St Stephen's Bow. The tall buildings to the right were all associated with the New Inn. Throughout much of the 17th and 18th centuries the inn was used both as an inn and a cloth hall, as a meeting place for judges during the Assizes and by Freemasons as the only Lodge in the city. In fact it could be argued that the New Inn was the social and cultural centre of the city prior to the construction of the assembly room at The Hotel in 1769. Cosmo III, the Grand Duke of Tuscany stayed at the inn in 1669. In a letter from the dean of Exeter Cathedral to the British MP Richard Grenville-Temple in 1767 the dean advises staying at the New Inn "because your servants will be nearer the Deanery." The New Inn went into a decline after the main cloth fair was moved to South Street during the Commonwealth, and naturally there were many other coaching inns in the city providing stiff competition. The inn had probably closed by the end of the 18th century, although it was still used as accommodation for magistrates and judges until 1836. 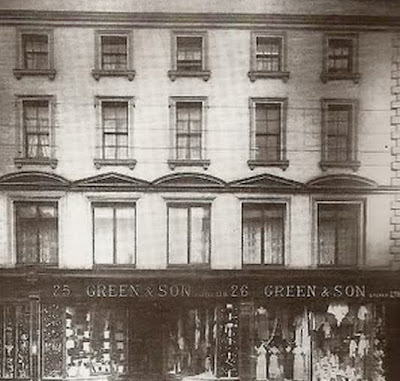 In 1849 it was purchased by Green & Son, a company specialising in drapery and fabrics, and it was in this year that an attractive neo-Classical facade was added to the front of the building (as shown in the photograph top). 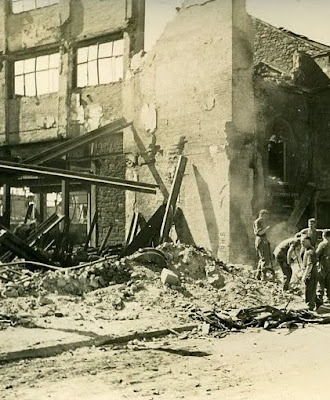 The photograph left shows all that remained of the New Inn following the bombing of May 1942. The broken Gothic window in the arched bow of St Stephen's church can be seen on the right. The New Inn, including the Apollo Room, was totally destroyed during the air-raid of 4 May 1942. It's impossible to say what else was lost as little seems to be known about the actual building itself at the time of its destruction. There are hardly any surviving images even of the Apollo Room itself. Robert Dymond in 1880 was of the opinion that nothing had survived of the original structure, except perhaps a well in the cellar, "its circular wrought courses of red sandstone plainly testified to its antiquity." However, it seems more than likely that many earlier elements from the 15th, 16th and 17th centuries remained within the fabric up until its destruction. 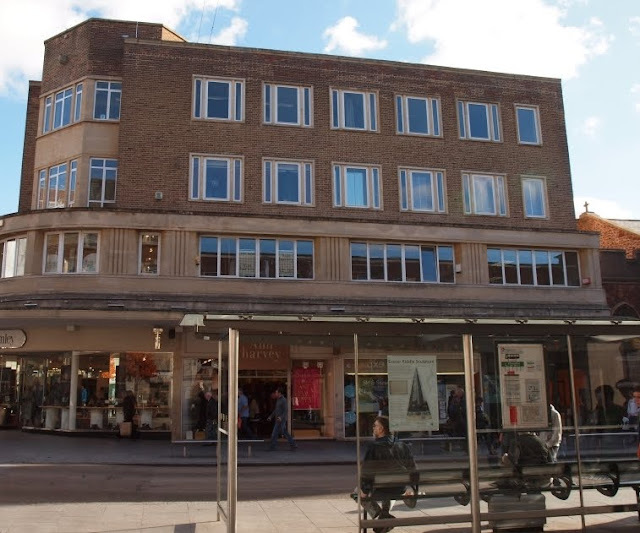 Today the site of the New Inn is occupied by the bland post-war building shown below.